Rapid translation system: a novel cell-free way from gene to protein (M. Hoffmann, C. Nemetz). Protein expression and refolding - a practical guide to getting the most out of inclusion bodies (L.D. Cabrita, S. Bottomley). Towards a systems biology understanding of human health: interplay between genotype, environment and nutrition. Public health issues related with the consumption of food obtained from genetically modified organisms (A. Paparini, V. Romano-Spica). p75 neurotrophin receptor signaling in the nervous system (Y. Hasegawa et al.). Phage display for epitope determination: a paradigm for identifying receptor-ligand interactions (M.J. Rowley, K. O'Connor, L. Wijeyewickrema). DNA vaccines and their application against parasites - promise, limitations and potential solutions (P.M. Smooker et al.). Drug-induced and antibody-mediated pure red cell aplasia: a review of literature and current knowledge (R. Smalling et al.). 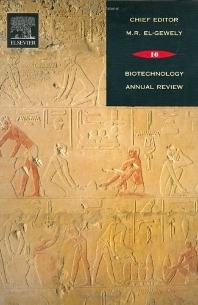 Using the biologic license application or new drug application as a basis for the common technical document (M. Foote). Guidelines and policies for medical writers in the biotech industry: an update on the controversy (M. Foote). Radioimmunotherapy of Non-Hodgkin's lymphoma: clinical development of the zevalin regimen (C.P. Theuer et al.). Biosimulation software is changing research (R.L.X. Ho, L.T. Bartsell).